Browsing bathroom inspiration for your home design can be an exciting process. It is an important room of the house that should be a personal and functional space for both you and your family. It is often about figuring out the aspects of bathroom design that you love and creating your perfect space. 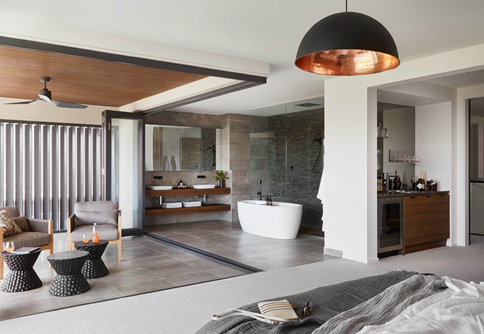 Here are a few bathroom designs from our builders to feed your imagination. This bathroom design is incredibly sophisticated. The spacious design is convenient for bathrooms that are shared amongst a few people, as well as the twin sink which increases functionality and bench space. 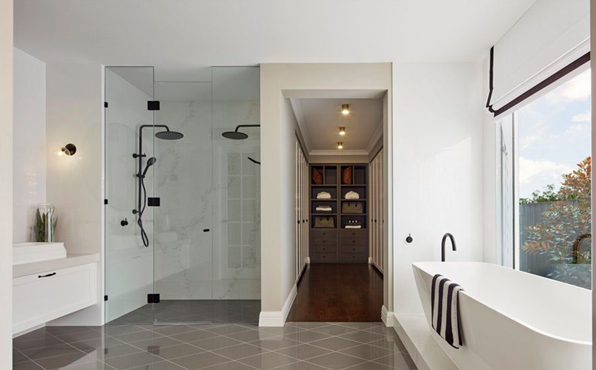 A shower that is built into the wall design allows for a cleaner look that is definitely one to consider when searching for bathroom inspiration. A favourite from this design is the tiled walls from floor to ceiling. 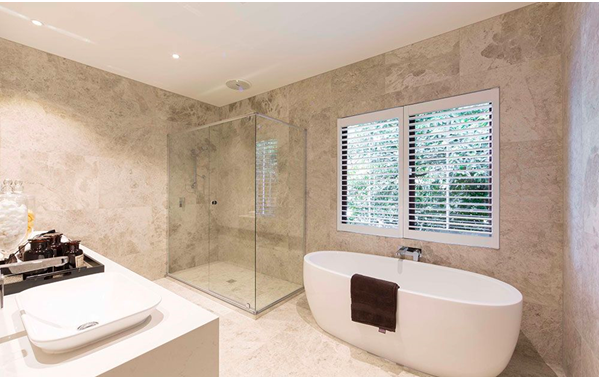 The marble tile design creates an elegant look that completes this simple bathroom design. It will cost more to tile from floor to ceiling but will make for easy cleaning and bathroom upkeep. When browsing bathroom inspiration, a large bench space will be a feature that consistently catches your eye. This design features an eye-catching mirror which is always a stunning addition to any bathroom. If you want to place your toilet inside your bathroom, consider placing it in a separate room like in this design. It can be nicer to hide the toilet and it also means the entire bathroom won’t be occupied if only the toilet is. 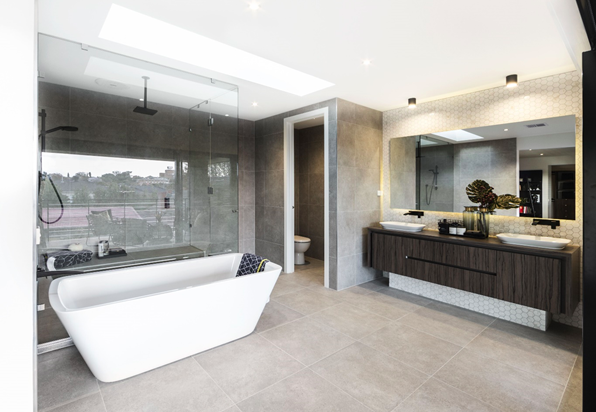 If you are looking for for a luxury bathroom design for your ensuite consider an open floor plan. This will expand your space and allow for additional features. This luxury design includes a textured wall and large shower area that is complemented by wooden shelves and cabinetry – don’t underestimate the comfort and style of an earthy bathroom design. Clutter is out and Minimalism is in, we share how you can embrace it in your home. Contact us at iBuildNew on 1800 184 284 or book a call online for assistance in finding your perfect building and home design match. We can help you be one step closer to finding your ideal bathroom design for yourself and your family.